It might seem difficult to start a conversation on the cultural activities of a city or region, when those taking part in said activities see their development as the beginning of something greater while, paradoxically, being certain that there is a specific starting point in the present. Generally speaking, cultural centers nowadays usually experiment with new activities. This is due more or less to a demographic change at the heart of the surrounding artistic community, generally spurred on by the creation of specific programs, whether promoted by the State or private funding. In this sense the city of Guadalajara is unique in that interest in contemporary art amongst the artistic community has notably increased over the last decade, although there has been no clearly definable influx of cultural agents. The birthplace of José Clemente Orozco, an artist extremely important to art history, Guadalajara appeared at the beginning of the nineties as a marketing space for avant-garde works of art although there was nothing prior leading up to this position.. From this viewpoint, the most surprising thing about the enthusiastic "tapatí­o"scene is that, at times, it appears to unconditionally accept the interval of silence between the early contributions made by the great masters of painting, and the recent frenzied contemporary activity. This is a scene painstakingly put together by a few artists; it's as prolific as it is promiscuous and has, proudly, worked hard on remaining true to itself despite always looking towards the exterior. In this interview, Gonzalo Lebrija, one of the Guadalajaran artists who has received the most attention in recent years, tells of the processes of cultural negotiation through which the "tapatí­o" scene has passed. Co-Director of OPA (Oficina para Proyectos de Arte), Lebrija explains the details of his own initiatives at the head of an independent space, and describes the atmosphere of a city that is attempting to become the next Mexican cultural center. Magali Arriola: How has Guadalajara's contemporary art scene changed since the Expo Arte fair days? Do you believe that Expo Arte affected the artists' way of working? Gonzalo Lebrija: I believe that Expo Arte stimulated Guadalajara's artistic scene because it was the first real source of contact for the public, as well as for a generation of artists, with the international art scene. At that time the only group of artists operating both collectively and individually was Jalarte, which included: Fernando Palomar, Rodrigo Aldana, Alejandro Ramí­rez, Daniel Navarro, Ernesto Ramí­rez, Francisco Balzaretti and Omar Guerra. Subsequently a new group was formed by architecture students from ITESO - to which I belonged - called Incidental, which included Francisco Ugarte, Jose Dávila, Hugo Cervantes, Javier Dueñas, Foit, Juan Carlos P. Trejo and Diego Quiñones. 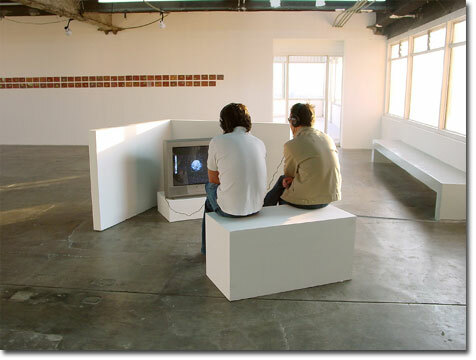 This group became known with its second exhibition, which was held on the roof of the Condominio Guadalajara in 1998, during the official program of the last Expo Arte. MA:How would you place OPA in this context? What role do you believe an institution with its profile is playing at the present time, and how do think its position has evolved since it began? GL: After Expo Arte and Carlos Ashida's direction at the Museo de las Artes Guadalajara, a long time went by without any exhibitions of contemporary art taking place. Ashida, who was in charge of the Museum for 3 years, presented exhibitions by national and international artists. I remember Bing Bang by Pablo Vargas Lugo, Plan de San Lunes by Gabriel Kuri, Luz a la lumber by Fernando Palomar, Parpadeantes eyes by Fabryce Hybert, and one by Michele Blazy, the title of which I can't recall. Ashida also presented collective exhibitions such as Propulsión a Chorro - featuring "tapatí­o" artists of my generation - Learning Less, with Gabriel Orozco, Richard Wentworth and Fischili and Weiss, with Patricia Martí­n as curator, and other selections from important collections, such as those of Tom Patchett and Aurelio López Rocha. Later, we decided to fill the gap by opening an art center to house the works of contemporary artists with an international background, despite the lack of demand for such a space. Among the artists and curators participating in the OPA program are Anri Sala, Nic Hess, Jim Lambie, Yutaka Sone, Pipilotti Rist, Artemio, Mario Garcia Torres, Eduardo Sarabia, Pentti Monkonnen, Eric Wesley, Liz Craft, Patrick Charpenel, Patricia Martí­n, Pip Day and Pash Buzari. There has been a remarkable increase in the interest shown by the public over the course of the two and a half years that OPA has been operating. MA: OPA has worked mainly with foreign artists. Why is that? GL: Because it was something lacking in the scene, and close contact with the proposals currently circulating in the circuit of international contemporary art institutions is an important stimulus for any local scene. Moreover, all the other spaces are dedicated to local or national artists. MA: Which OPA exhibition do you think has had the most impact on the local scene? GL: It is hard for me to think of one that may have been more important than the others. I think this is due to the fact that the program has received a quite varied range of proposals. The space is also being constantly modified. Perhaps the most extraordinary exhibition in regard to attracting a large audience was Pipilotti Rist's show, which was attended by a large number of residents from the Swiss colony in Guadalajara.